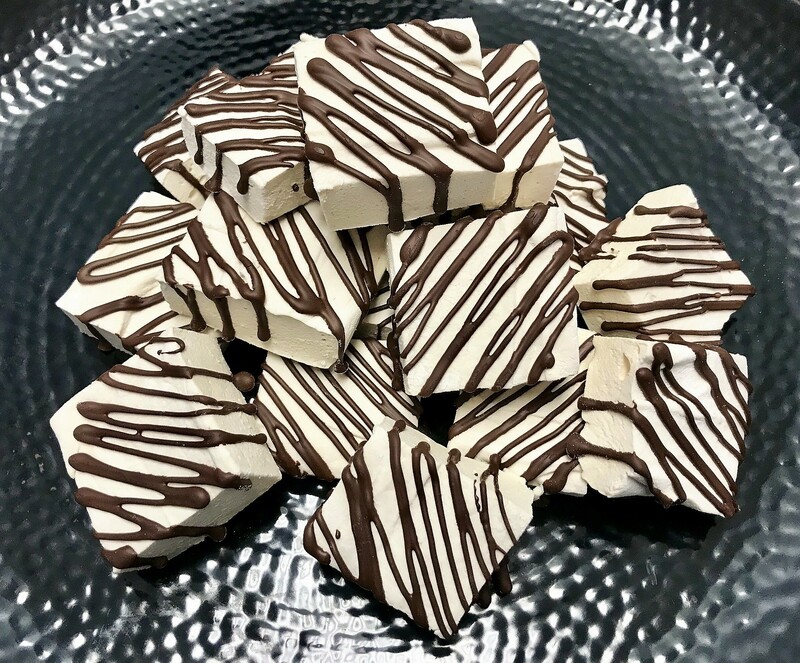 Espresso Marshmallows are the perfect way to finish a meal or a treat to go with your afternoon coffee. Most people think of marshmallows when stilling out by a campfire while making s’mores or when they are sipping on a rich hot chocolate. Surprisingly most do not know how to make this simple treat or even know what is in it. The simplest explanation of this fluffy delicacy is sugar brought to the soft ball stage then whipped with bloomed gelatin until doubling in volume. As sugar progresses through the stages, it develops deeper, more complex flavors. Notes of bitterness come through gradually as the temperature increases. 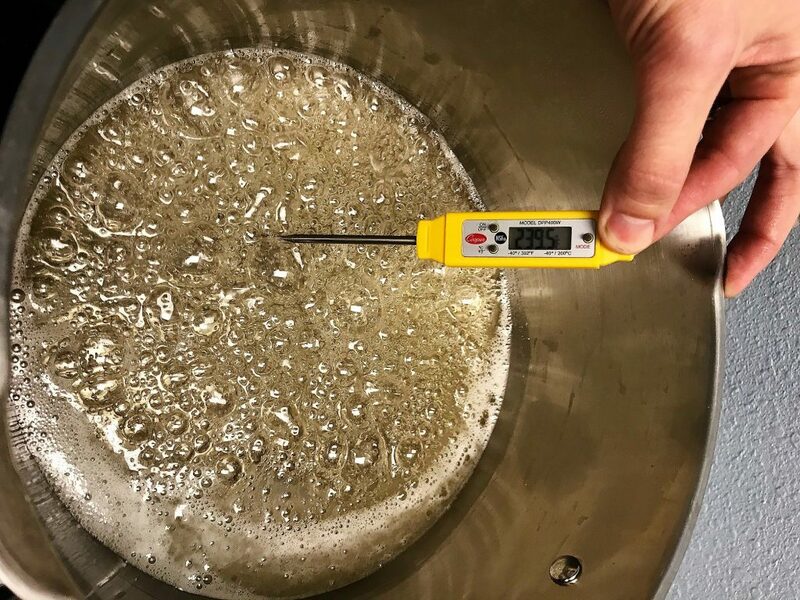 Cell structure of the sugar undergoes an assortment changes with the top temperature reached. As the sugar cools to room temperature the cell structure becomes rigid and brittle. 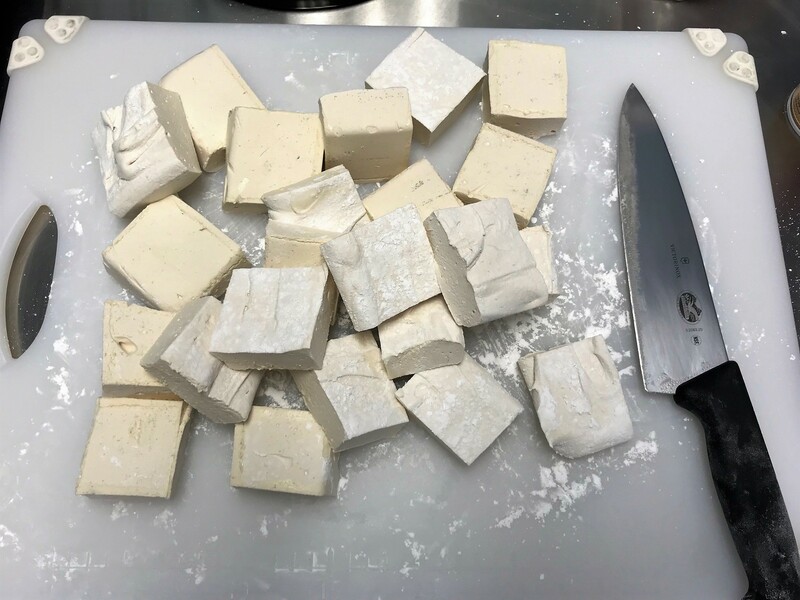 Marshmallows can be made a few different ways. The following recipe covers the simple technique of soft ball stage sugar and gelatin with the incorporation of espresso and dark chocolate. The espresso I brewed for this recipe was made using Franke’s automatic coffee machines. 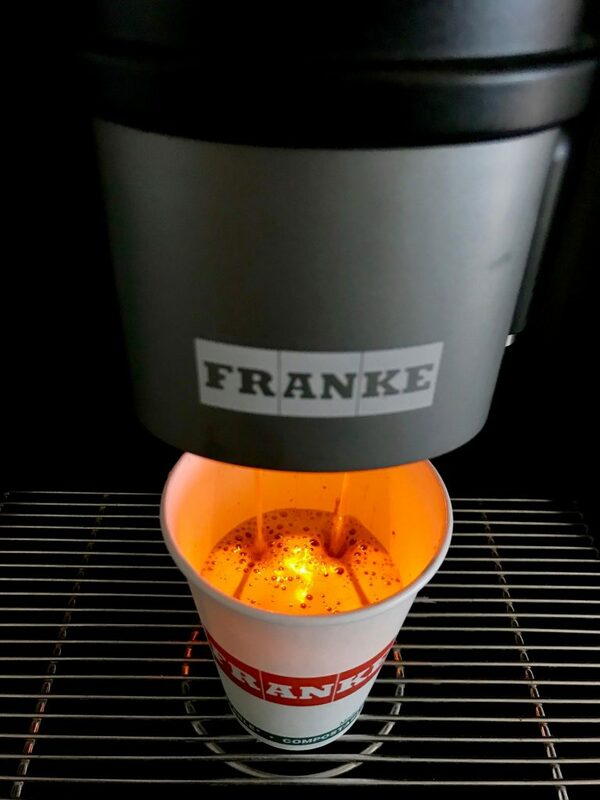 Franke fully automated coffee machines are extremely simple to use: a single touch is all it takes to serve up wonderful barista coffee, milk creations, chocolate and tea. The quick and easy preparation is unbeatable in self-service and food-service operations. 1.Lightly spray oil on a 9” x 13” pan or 2” half sized hotel pan. 2. Dust the pan with powder sugar. 3. Brew 4 shots of espresso (or ½ cup of dark coffee) then put in a reach in to cool. 4. Pour white sugar, corn syrup and water into a medium sized pot over medium heat. 5. Once the espresso (or coffee) has cooled, pour into a stand mixer bowl with the gelatin to bloom. 6. Gently stir the sugar/syrup/water mix until fully incorporated. Make sure not to splash again the edges of the pot or it will burn the sugar. 7. 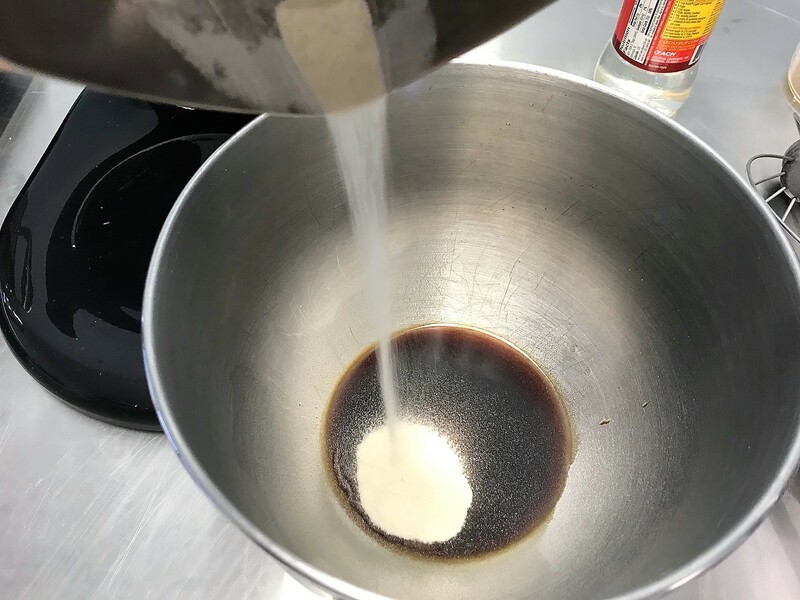 Pull the boiling sugar off the heat and slowly pour into the stand mixer with the whisk attachment going at medium speed. 8. Run the mixer at medium/high speed (4-6 on KitchenAid) for 8 min. 9. Add the vanilla extract and turn up the mixer to high speed (8 on KitchenAid) for 3-4 min or until thick and fluffy. 10. Immediately pour fluff into dusted pan. Do not worry about getting every little bit out of the bowl. The fluff will set if you take too long. 11. Smooth the fluff out with a rubber spatula. Lightly dust the top with powder sugar. 12. After 5 min. wrap the pan with plastic and let it sit for 4-6 hours or overnight to completely set and cool. 13. 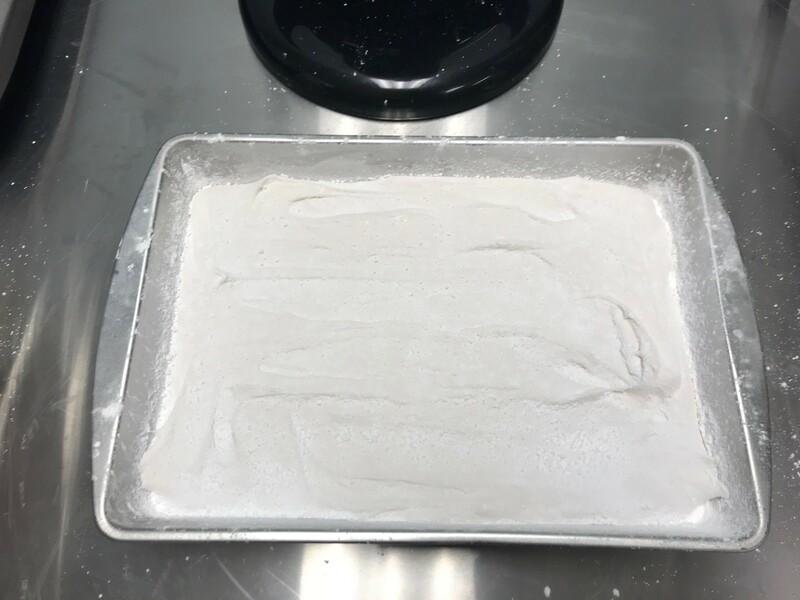 Dust a cutting board with powder sugar and pop out the marshmallow onto the board. 14. Spray a knife with oil to keep from sticking when cutting the squares. Cut the squares to the desired size. 15. 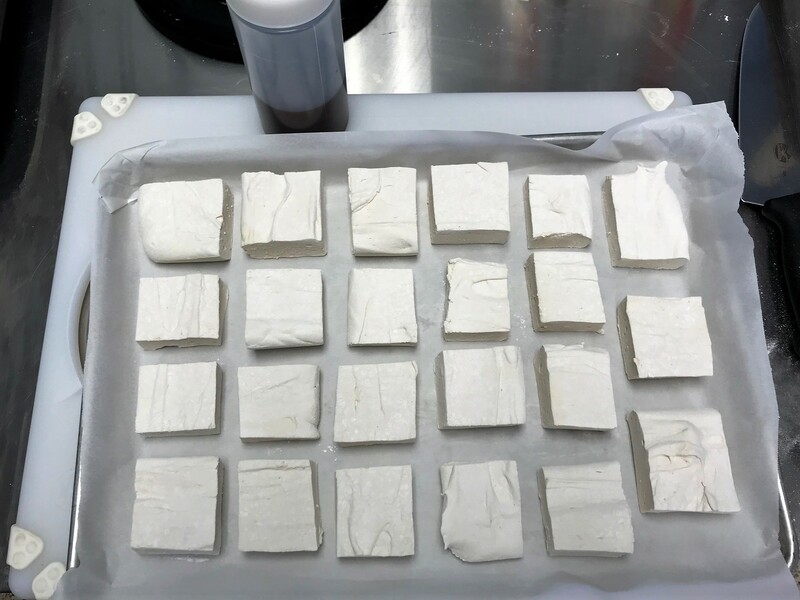 Toss the squares in a bowl with powder sugar until well covered. 16. 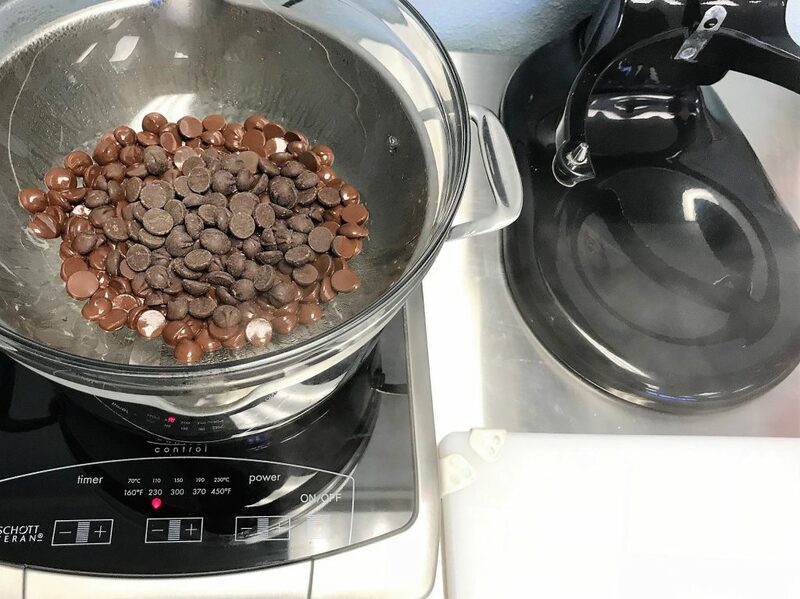 In a double boiler, melt the dark chocolate and transfer into a squeeze bottle. 17. 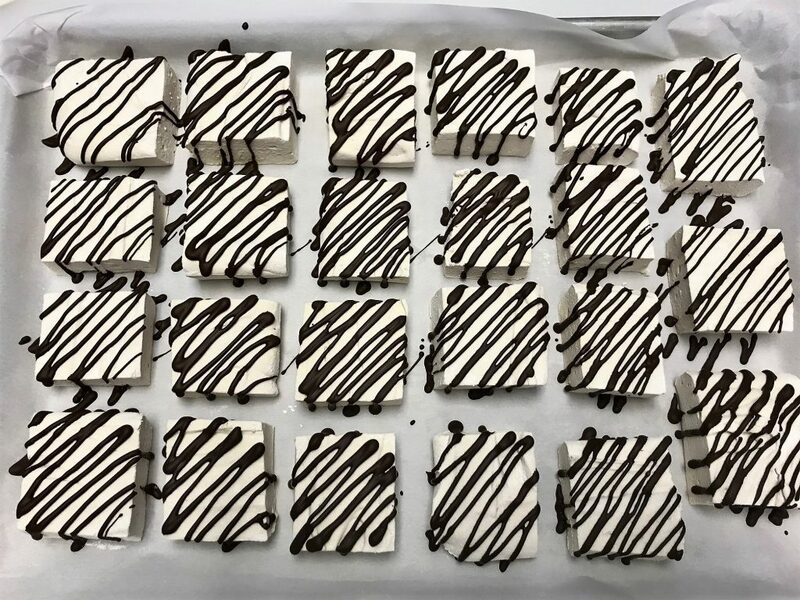 Using parchment paper as a base, drizzle the chocolate in whatever design you like on the marshmallows. 18. Wrap the marshmallows and keep for up to two weeks. Below is a sped up video of the whipping and drizzle process.